These illustrations demonstrate a Nucleoplasty. The needle is inserted into the disc under fluoroscopic (X-ray) guidance and close to the area where the disc is bulging. Coblation therapy enables tissue to be removed quickly and efficiently without damaging nearby normal structures. The picture second from the top demonstrates how the tissue is actually "dissolved". A lumbar Nucleoplasty is performed for pain that is caused by damaged intervertebral discs. The aim of the procedure is to reduce the pressure on the small nerves that are found in the annulus fibrosus. This is done by shrinking the nucleus pulposus (see the section Anatomy of the Spine). The modality used for this is similar to radiofrequency rhizotomy, but a device is used which utilises coblation technology to dissolve tissue without damage to nearby normal structures. The reason why your specialist performs this procedure and not a more invasive procedure is because he or she is trying to be as conservative as possible in treating your condition. The aim is to treat your symptoms without resorting to a more invasive operation. When undergoing this procedure, you will be lying on your stomach on bolsters or pillows. Your specialist will use an X-ray machine to guide the needle that is used to do the procedure with. 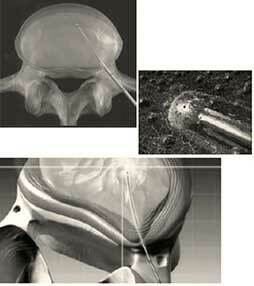 A patented plasma device is then inserted through the needle into the disc, whereby excess tissue is removed. Removing some of the tissue from the centre of the disc causes a reduction in intra-discal pressure, which in turn eases symptoms. Routinely you will receive a date for your follow-up appointment with your specialist. This may vary from anything between two and six weeks, but you will be seen earlier if there are any complications. It is important to realise that you will have to protect your back for the rest of your life and apply good back habits (see the section Caring for your Spine). It is also important to appreciate that the efficacy and longevity of this treatment is still under investigation.